Our 2017 Road Trip, Part 5: Miles of Maryland Mountains « Midlife Crisis Crossover! The view of westernmost Maryland from an I-68 overlook. 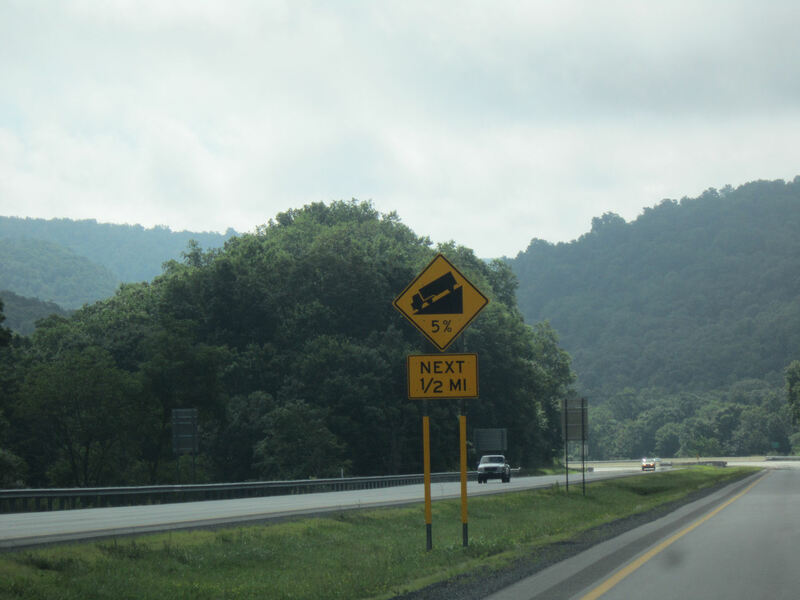 Much of the drive from Pennsylvania through West Virginia to western Maryland looked exactly as show above — interstates surrounded by deep sylvan panoramas. 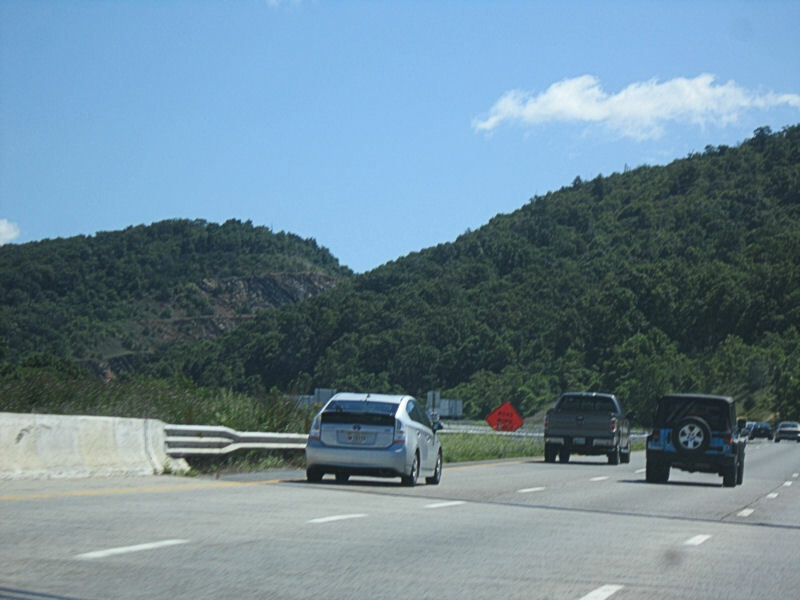 The first time we drove this way in 2003, my son was disappointed that the Appalachians lacked pointed, snow-topped peaks like in all the movies about the Rockies or the Himalayas. 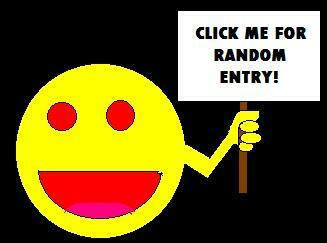 Mountains may be massive, but to some audiences they’re no less subject to stereotyping. 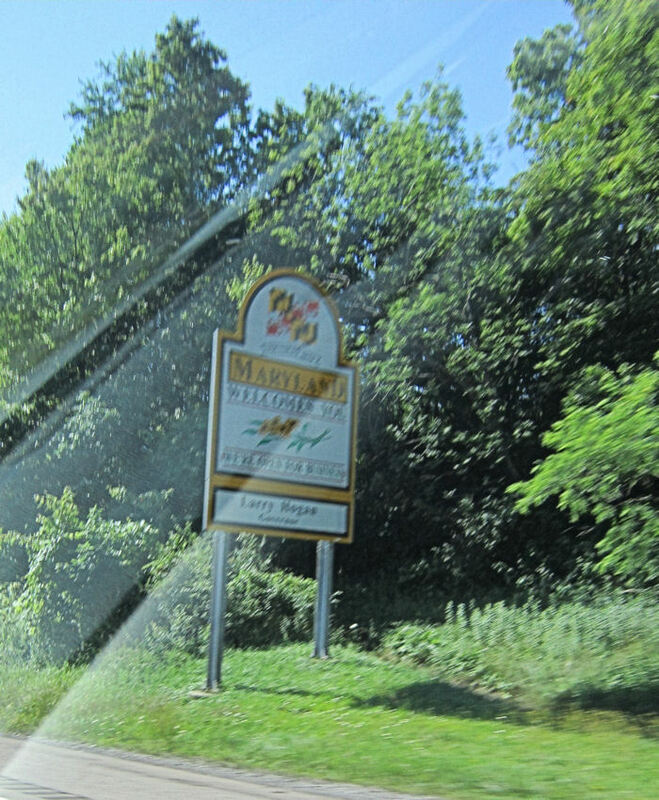 We nearly missed the official Welcome to Maryland sign. Sometimes these can be tough to catch when you’re dealing with changing traffic patterns, obstructive trucks, or uncooperative cameras. Our eastbound route looked like endless forests for hours. A few remote spots reminded us of that New Zealand grandeur from The Lord of the Rings, but they’re hard to catch during the split-seconds where they’re viewabla. If you drive like me, your top priority is getting to Point B quickly and efficiently whether the other drivers want you to or not. I’m much better at accommodating full stops for sightseeing or physical needs than I am at temporary slowdowns for aesthetic purposes. So while I’m at the wheel, Anne does the best she can with the opportunities afford her. Sometimes that means sitting back and just enjoying the sights; from time to time it means she can capture something on camera, assuming nothing blocks her shot such as stray trees, highway fences, lollygagging semis, tilting roadways, or the Earth’s curvature. 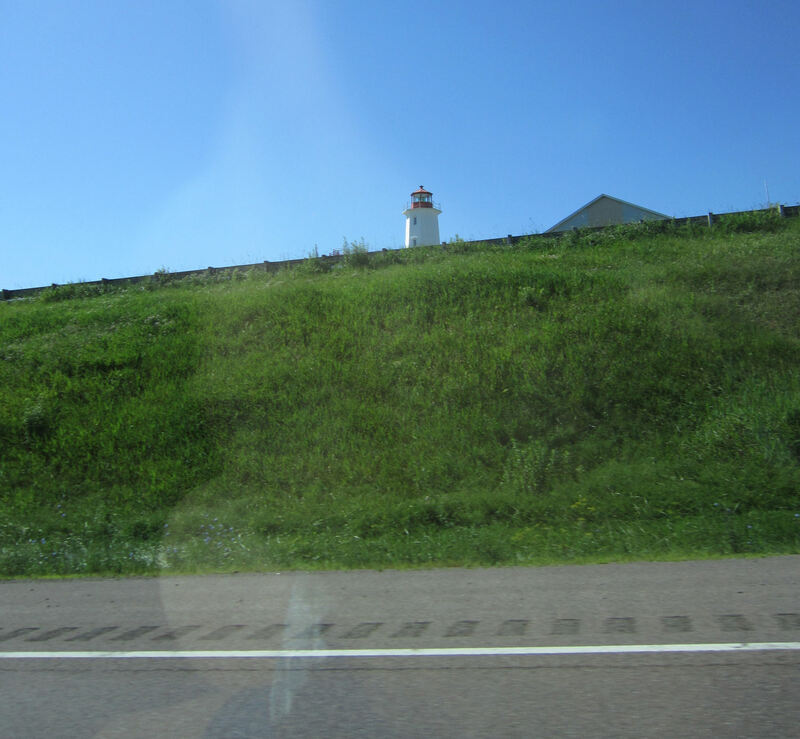 Surprise roadside lighthouse nowhere near a body of water. 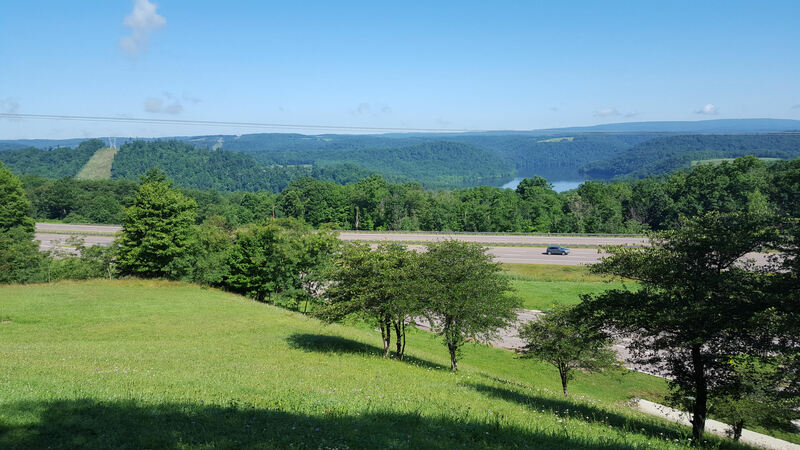 One point along I-68, the Youghiogheny Overlook Welcome Center, allows travelers the chance to get out for a few minutes, collect tourism brochures, say hi to a lone friendly worker overseeing the place, and take in that verdant horizon. This center is one of several facilities that reopened just a few years ago by the current governor’s mandate, after a previous regime had shut down numerous non-essential services due allegedly to budget issues. It’s interesting to compare values between administrations and play “spot the differences”. 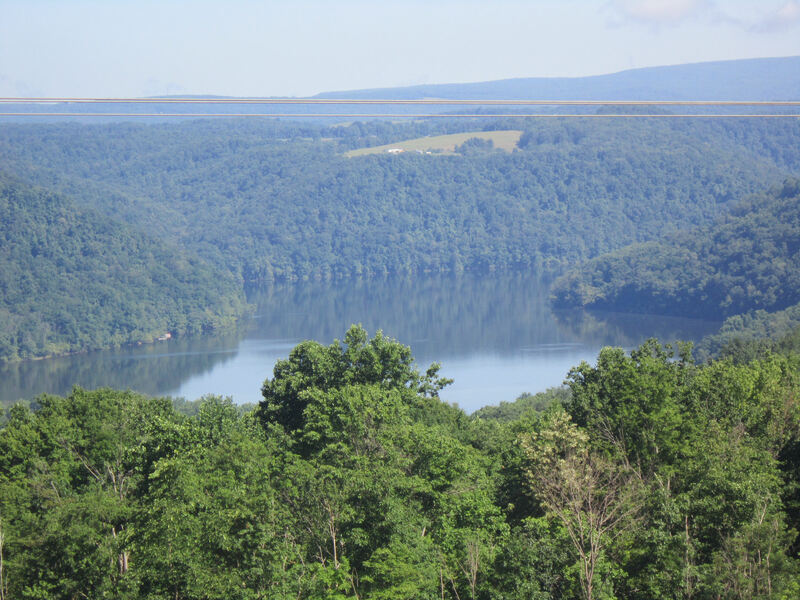 From afar that’s Youghiogheny River Lake. Don’t ask me how it’s pronounced. Drivers have to find their own sources of amusement on these long treks since they can’t — well, okay, shouldn’t — be indulging in their own photography. Anne gets nervous whenever I multitask too much behind the wheel, which I guess is understandable. Beyond “getting to point B” my secondary objective is clear: avoid and/or outmaneuver the competition, preferably in legal ways and without sending them flying off the mountainside in a fiery cartoon crash. Driving up steep inclines is tedious and cars don’t like it, but there’s a fun reward: the equally steep downward slopes on the opposite sides in this elevated topographical playground. At the times the downhill stretches were so angled and so long than I could coast for minutes at a time without touching the accelerator. I braked only if I had to, if other drivers were overly cautious and/or in our way. For the safety of others and of their cargo, professionals whose vehicles are above a certain weight are not allowed to play this game. 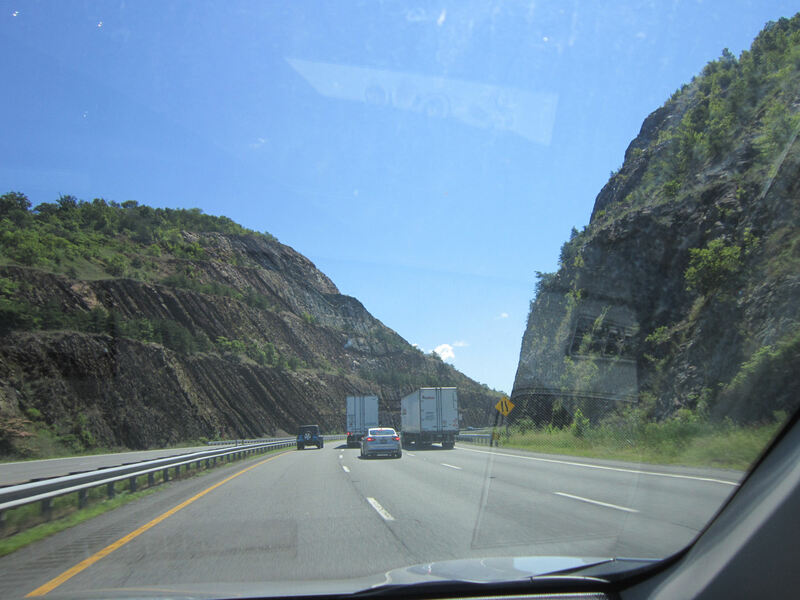 Near the end of this leg we approached a familiar sight from our past: Sideling Hill, which we last passed on our way to Washington DC in 2003. As with the Youghiogheny center, Sideling Hill’s rest stop had been kaput for a time because the politicians in charge hated spending money on quality-of-life special features. We didn’t pause this time, but I understand it’s now up and running so other wanderers can have the same chance we did, though some of its museum pieces were relocated elsewhere and not returned. Nature persists whether we spend money to gaze upon it or not. If we make the time and the effort to meet it halfway, so much the better.